Roses are red, roses can be blue, some prefer yellow roses. Maybe black roses are for you? There are few images as popular in tattooing as the classic rose. Historically, sailors would adorn their bodies with roses in tribute to their wives or girlfriends, to serve as a reminder when they were far from home. Today that tradition is being honored strongly in tattooing and developing well beyond those classic styles. 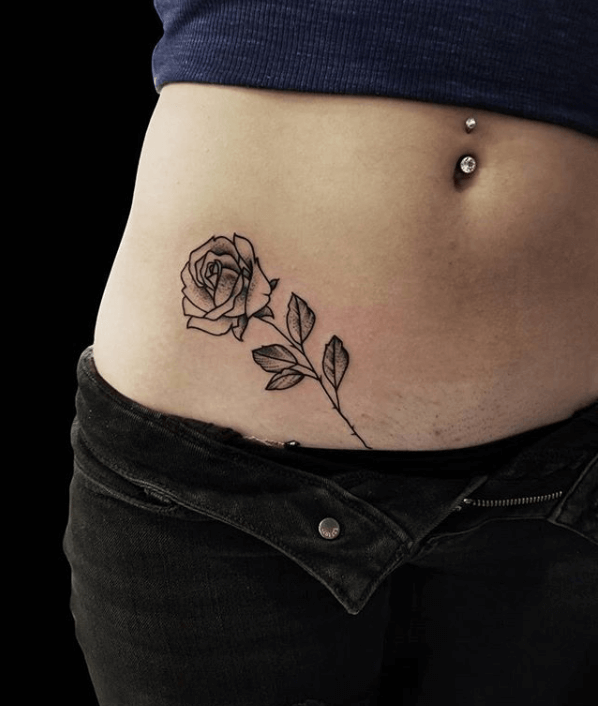 You’ll find that each tattooer has their own version of cultivating rose tattoos. 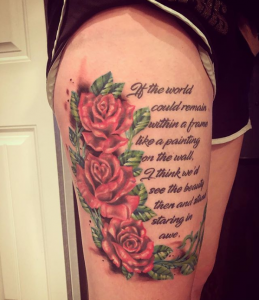 From natural colored realism to bright or bold colors to simple fine line roses that appear delicate on the skin. 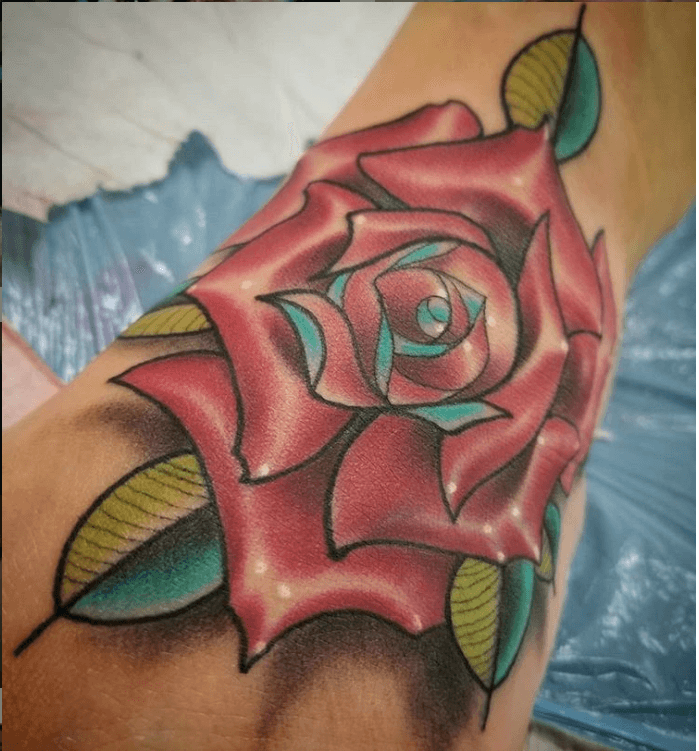 In this article, we will take a look at some of the different versions of roses created by our very own artists here at Mantra Tattoo. 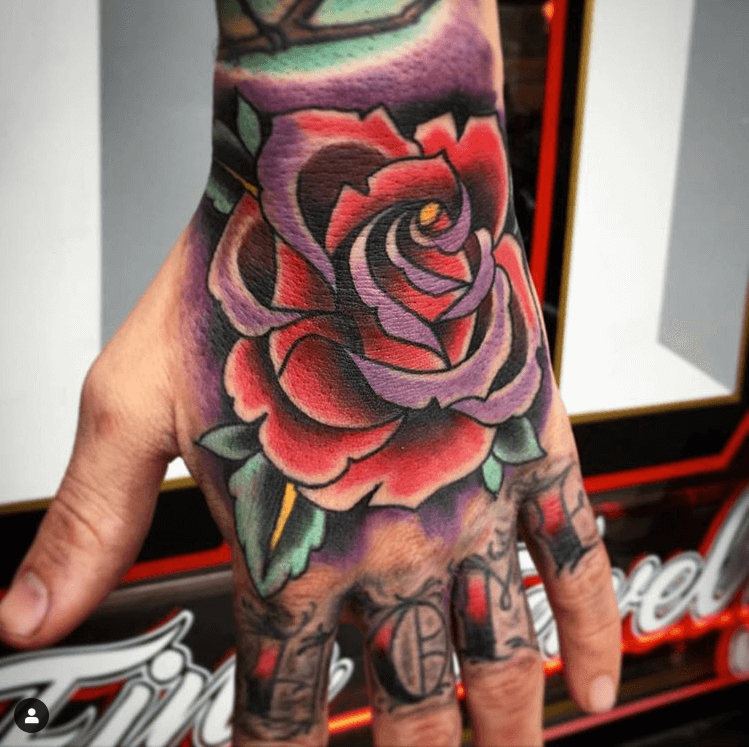 Mike O employs a bold color scheme for this sweet hand jammer. The phrase bold will hold certainly comes to mind. 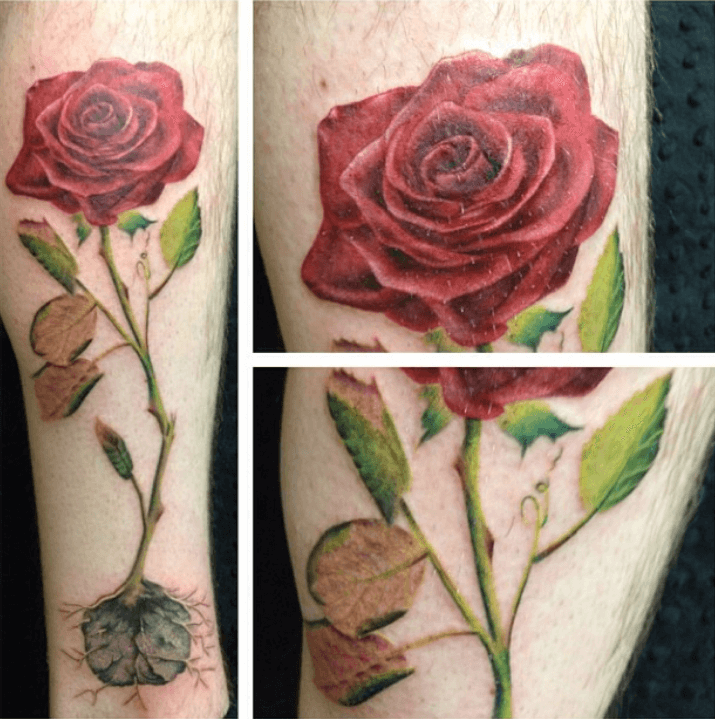 Jen created this soft more natural rose growing out of concrete, symbolizing strength and perseverance. Using white highlights, Geno really makes this rose stand out among wall flowers. Using rich golden tones, Kidd delivers roses that are unique to his style. 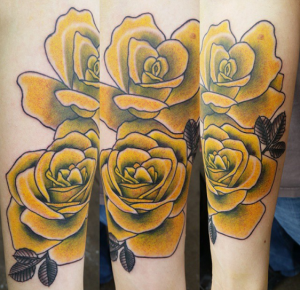 Yellow roses typically symbolize friendship and can emphasize feelings of joy and delight. Daniel lays it down with a more recently popular fine line style in black. Bold yet delicate, roses like these are sure to please! 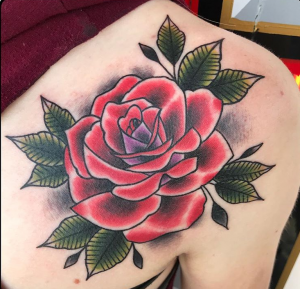 Ben used a Neo Traditional styling for this rose. A modern take on traditional designs, this style combines bold outlines with less realistic, more illustrative features. 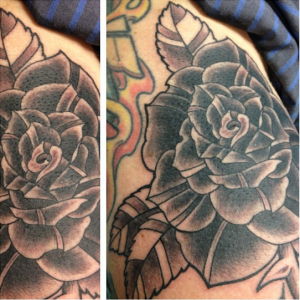 This black rose by Chris focuses on unique texture combined with softer shading to give a more dynamic look. Black roses typically symbolize love for the departed. Jake combines classic roses with script, perfectly accenting this hopeful phrase. 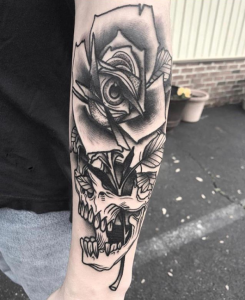 Mike A throws out a curve ball with his interpretation of a classic skull & rose combination. The eye in the center of the rose adds a psychedelic touch.